One year ago, a coalition of civil society organizations from Germany published a first “shadow report” on the state of the country regarding sustainability. The report had to conclude that much remained to be done. One year later, an even larger coalition again takes stock – and it will come as no surprise that the results are very similar, despite the fact that the report addresses different subject areas this time. The point of departure – but not the only standard – for considerations of the more than 40 authors of the 2017 report is the 2030 Agenda for Sustainable Development adopted in New York in September 2015 by the heads of State and Government of all UN members (including the German government), together with its 17 Sustainable Development Goals (SDGs) that define demands on global and national policies as well as paths to their fulfilment. Even though the 2030 Agenda is strongly reminiscent of preceding projects of the United Nations, in particular the Millennium Development Goals (MDGs) that expired in 2015, it does entail some qualitative progress. For one, it represents an actual sustainability agenda, that is, it does not deal exclusively with issues of social or economic development but views them in interaction with ecological issues and vice versa. Even more, the three classical pillars of sustainability – social, economic, environmental – were augmented by the two aspects of peace and global partnership to a five-dimensional model “people, planet, prosperity, peace, partnership”. Moreover, the 2030 Agenda has a universal ambition. It is no longer meant to exclusively or primarily formulate strategies for the so-called developing countries or the countries of the Global South, but to spell out the necessary contributions of the rich countries of the Global North. What change is needed in Germany, in German policies, so that Germany as well as other countries on the planet can take a path of sustainable development? Germany, too, is still miles away from a development towards a sustainable society in the sense of the five dimensions of the 2030 Agenda. First of all, it should be noted that Germany is still far from being on a path to sustainable lifestyles or production patterns. This applies to the situation within Germany and affects people here in social (keywords injustice and poverty), economic (energy policy and infrastructure) and ecological respects (including particulate pollution, state of the ecosystems) as well as in an increasing propensity towards violence and polarization (extremism and populism) that call the principles of “peace” and “partnership” into question. Thus, “sustainability” for Germany would also mean improving the living situation of people in this country. Moreover, the way German society is being organized, our consumption and our production in Germany has impacts on people not only in neighbouring countries but on the other side of the globe. Germany has a ‘footprint’ in the world that is bigger than it should be. This applies to resource consumption and to the emission of greenhouse gases, but of course also to topics such as agricultural policy or foreign trade. Finally, the report finds that Germany does not live up to its international responsibilities, including in the area of development cooperation, but also in the areas of global economic and environmental policy. The analyses in the report are, not least, addressed to the policies of the German government, whatever constellation it may convene in after the federal election in September of 2017. For – and this is shown by the contributions in our shadow report – relying on a change in awareness of consumers and producers alone will not bring us closer to the goal of sustainability fast enough. The complexity of sustainability policy as a whole but also the interactions among the individual subject areas are reflected in the structure of the report and in the many cross-references among the individual chapters. In view of the interconnectedness of the individual problem areas, this overview does not follow the structure of the report but sums up related areas. Bernd Bornhorst analyses contradictory tendencies in German development cooperation. Regardless of increasing budgetary allocations, he sees the danger of a profound paradigm change in German foreign and development policy. “The value orientation of foreign and development policy is increasingly being overshadowed by a policy of closing borders and fending off refugees. There is a danger of development policy being instrumentalized for domestic and security policy interests.” Despite many initiatives, programmes and plans that make sense in principle, Development Minister Gerd Müller offers little in opposition. According to the author, the implementation of such initiatives and plans often exists only on paper. A coherent, value-oriented policy is therefore not in sight. Jens Martens finds that German foreign policy suffers from “selective multilateralism” in his contribution “Stepping on the brakes at full throttle”. According to Martens, the German government shows particular commitment in diplomatically supporting the 2030 Agenda at the United Nations; it cannot be accused of inaction. However, Germany is among those stepping on the brakes with respect to numerous controversial topics, from creating a sovereign debt workout mechanism, through international tax cooperation and the debates on an international legal instrument in the area of business and human rights, to the negotiations on a nuclear weapons ban. But coherence in SDG implementation requires more political commitment, especially in the ‘hard’ areas of economic and financial policy. Taxes and charges are where push comes to shove, which is why we have several articles on this major area under construction. Swantje Fiedler and Clemens Wunderlich find: Germany’s tax policy is not sustainable. “Taxes and charges are a particular burden for the factor labour, while causing climate, environmental or health damage is hardly taxed or even subsidized. The time is ripe for a sustainable finance reform.” Sarah Godar and Lisa Großmann find that the government has considerable deficits in the fight against tax flight and fear a new round in a renewed race to the bottom in tax policies. Hundreds of billions of euros are lost annually to States worldwide through the erosion of the tax base and profit shifting of multinational corporations. Staggering amounts that make the relative inaction of governments seem even more scandalous. Too much corporate influence on policy-making is also observed by Myriam Douo and Sophie Colsell. With its “Better Regulation Agenda” the EU Commission wants to reduce bureaucracy and simplify European law. In practice, it means more co- and self-regulation of companies and thus substantially jeopardizes progress in the direction of sustainability. Everything is subordinated to short-term economic interests. A failing grade from the perspective of sustainability. The diesel car emissions scandal has shown where such self-regulation leads. This is investigated by Jürgen Resch in his contribution “Automobile Republic of Germany”. He finds: “With the election of Angela Merkel as chancellor of a grand coalition in the autumn of 2005, an independent environmental policy in the automotive sector came to an end. The four German environment ministers appointed by Angela Merkel essentially represented and represent the interests of the automotive industry on matters of road traffic.” As a consequence, more than 10,000 people in Germany die of asthma and other respiratory diseases every year. According to the author, there is no improvement in sight, the State acts only in rhetoric. For this reason, “environmental and consumer protection associations have to uncover illegal collusion and monitor fraudulent violations with respect to CO2 declarations and ineffective catalytic converters. They thus take on responsibilities of the State, which quite generally no longer dares to enforce law and order in the case of large companies.” Looks like a major construction project, traffic jams and diversions are to be expected. Ragnar Hoenig and Luise Steinwachs address a topic that will become significantly more explosive in future. Germany has greatly expanded the low-wage sector since 2000. It hardly comes as a surprise that the consequence of wages that hardly suffice to live on will be pensions that suffice even less. “An essential factor is precarious or informal employment – especially for women – and weakly developed public social security systems that often do not allow people to have old-age security.” A construction site that won’t become smaller but bigger if nothing is done. Kai Lindemann and Thomas Fischer address this same question in the larger context. They criticize the fact that ecological renewal has long been thought of without a social dimension. According to the authors, however, this kind of renewal would not work. “Social inequality has increased in Germany in the past 20 years. The richest 10 percent of Germany’s population own 57.5 percent, the wealthiest 1 percent more than 24 percent of the total net assets. At the other end of the wealth distribution, 70 percent of the population own just 9 percent of the total assets.” The authors point to the fact that the highest-income groups are most committed to environmental matters, but mostly attach little importance to the social dimension. But as a minority they cannot accomplish the ecological renewal by themselves. The most delicate practical example of this is perhaps the debated coal phase-out, which we address for exactly this reason. Reinhard Klopfleisch asks: “What can a socially compatible coal phase-out look like? How would a ‘coal consensus’ be possible with the employees?” The considerations by services union ver.di to safeguard the social security of those affected by the renewal through a social pool are illustrative of the attempt to socially accompany ecological transformation. In “Cheap food and its consequences – with reference to the milk sector”, Kerstin Lanje and Tobias Reichert describe the German and EU agricultural policy as a sustainability disaster zone. According to the authors, forced industrialization is destroying smallholder farming not only in Germany, but also in Africa. This is a policy that has long lost majority approval, but the German government and the EU Commission are continuing it undeterred. With this policy, one can only conclude: botched construction work, tear it down and start from scratch. Jens Holst and Christian Wagner-Ahlfs investigate the phenomenon of antibiotics resistances, which is closely interlinked with today’s animal husbandry practices as well as human medical practice. Policy-makers have certainly recognised the problem. “However, the focus is being placed on medical-technological approaches – this does not do justice to the complexity of the challenges.” For this purpose, the system of factory farming and the incentive systems in human medicine, which lead to excessive use and abuse, would have to be changed. Sarah Schwarze and Naile Tanış write about human trafficking. Human trafficking is understood as a crime by which persons are forced to engage in activities against their will from which another person profits. However, fighting human trafficking means recognizing that there are no simple solutions. According to the authors, a multi-layered phenomenon requires multi-layered approaches. “The measures taken by the German government in the current term, which are also partly listed in the Sustainability Strategy, are certainly good first steps in order to counter human trafficking and exploitation, e.g., the comprehensive reform of the criminal offences in the area of human trafficking in 2016.” They emphasize, however, that, in addition to criminal persecution, strengthening the rights of those affected is key. “Fighting human trafficking and exploitation effectively is not possible without the support of those affected and without strengthening their position. For this reason, Germany should follow a rights-based approach that gives at least equal attention to the rights of those affected compared to penal prosecution.” This construction project is still waiting for its completion. In her article on education policy, Sarah Kleemann demands more investment in education to promote social justice worldwide. According to her, Germany would have to provide significantly more financial resources for the implementation of the SDGs in all fields of education. With respect to expenditures on education compared to economic power, Germany ranks only in the middle in the OECD – and she finds not only a huge backlog of needed refurbishment and investment in educational institutions, but also low and often precarious wages for those employed there. Apparently, there are different priorities in the ‘land of poets and thinkers’ nowadays. Martin Danner, Nicole Kauth and Holger Borner find considerable deficits in the implementation of the UN Convention on the Rights of Persons with Disabilities, which is, after all, legally binding. Despite the central leitmotif of the 2030 Agenda to “leave no one behind”, German policy-makers still act far too hesitantly in implementing the convention. According to the authors, establishing legal foundations alone faces large hurdles. Almuth Schauber deals with global urbanization. The consequence: more urban population, more poor areas and a growing urban middle and upper class with intensive consumption. “Massive infrastructure investment will be necessary: According to estimates, as many infrastructure projects will be newly developed in the next three decades as in the entire period of the past 5,000 years. For this reason, the way in which cities will be envisaged, planned and constructed in the next three decades is decisive for the implementation of the SDGs. The debate on ‘Smart Cities’ encounters the debate in societies worldwide on repurposing and reclaiming urban spaces. Schauber raises the question of “whether ‘Smart Cities’ provide options to socially and economically marginalized population groups for participating in the developments of their cities or for benefiting from the services offered”. Under these conditions, it takes a lot of imagination to envisage fair ‘Smart City’ concepts with just access for population groups hitherto excluded. Her demand “Liveable cities for all” is quite literally another major construction project. Consumption is also Kathrin Krause’s topic. She argues that consumption is a task for all of society, and for this purpose, government regulation is required. This cannot be delegated to consumers. “The German government must create a political framework and hold the most important actors on the market – producers and trade – responsible. State-defined minimum criteria for socially and ecologically responsible production are necessary for consumers and producers to be able to orient themselves on the market. The National Programme for Sustainable Consumption is not enough for this. The topic of sufficiency – how much is enough? – also needs to be addressed. In a growth economy, such a thought is already almost a violation of the rules. Sufficiency is also the topic of Nikolaus Geiler, who deals with the so-called bioeconomy. Not every organic label guarantees organic content. “At first sight, the transition from an economy based on mineral oil to one based on biomass could seem to be an essential contribution to a more sustainable society.” But the planet does not have enough biomass needed in order to replace fossil fuels by today’s biomass 1:1. Today, mineral oil is much too cheap anyway; the bioeconomy is stuck. Therefore, there is an increasing tendency to draw a connection to the Sustainable Development Goals. But: “The SDGs can only be realized in a global and national perspective if the priority is on reducing goods turnover – replacing fossil resources with biogenic resources can only be a secondary goal.” In this major construction project, we apparently do not even know what building materials we should actually use. Michael Reckordt also thinks that we consume too much. His contribution on deep sea mining shows: “German businesses are nearly one hundred percent dependent on primary metal imports. Their supply security is industry’s central resource policy agenda. Ecological and social impacts in the extraction areas are hardly being addressed. Together with the German government, the industry is trying to secure its future supply of natural resources also through deep sea mining.” The goal should be to place the far too high resource consumption on land and the ecological risks in the deep sea at the centre of the discussion – and not to promote a digitalization that increases resource consumption for electronics, electrical mobility and other goods even further. He concludes: “Deep sea mining is diametrically opposed to the implementation of the SDGs. The solution for our resource hunger must be found on land and must include an absolute reduction in consumption. For this purpose, the circular economy, the longer use of electronic goods and better recycling and repair capacities must be expanded.” Thus, better not to even get started on this construction project. Pedro Morazán writes about the more than 65 million people worldwide fleeing war, violence, hunger or natural disasters – as many as never before. Instead of the often cited combating of root causes, the focus is increasingly on closing borders. “In neoliberal globalization, capital but not people are allowed to move freely across national borders.” According to the author, this perspective also characterizes the Sustainability Strategy of the German government. As a winner from globalization, Germany has a great structural responsibility that is not sufficiently reflected there. The dangers to democracy from right-wing populism are taken up by Stefal Paul Kollasch and Christian Woltering. The answer to this danger can only be policy-making based on human rights and a society in solidarity: “Societal commitment must be recognized, protected and strengthened, i.e., provided with the necessary resources. The German Sustainability Strategy offers a good framework for this, but too few concrete starting points.” However, the analysis also makes clear that there has to be a change in thinking in society. We live in a migration society – and this needs to be shaped: “Integration and diversity belong in the constitution, we finally need an immigration law, intercultural opening […] must be given priority – e.g., based on the model of the implementation of gender mainstreaming […].” According to the authors, the structural discrimination against refugees must end, and an asylum procedure must be established that satisfies the requirements of the rule of law. The issue of distribution must be tackled, as well as more just tax and social policies. Finally, “the fight against racism and other misanthropic attitudes must be continued consistently at all levels, nationally and regionally, but also in society itself”. Richard Klasen and Martin Quack arrive at the same conclusion: The Sustainability Strategy must also address violence and hate crimes in Germany. The goal of “a safe environment in which citizens can live without fear from arbitrariness and crime” that was formulated by the German government itself has so far not been attained. In 2009 – that is, long before the so-called ‘refugee crisis’ – when Gesine Schwan cautioned against an “explosive atmosphere” in Germany and a “danger for democracy” due to increasing social inequality in the country, she was resoundingly rejected. However, hate crimes against foreigners and dissenters continue to increase--they have nearly tripled in the past seven years. In the new German Sustainability Strategy, these developments are addressed just as little as in other statements and policies of the German government on the implementation of the 2030 Agenda for Sustainable Development. Without doubt, this is another major construction project. 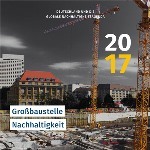 This text is based on the executive summary of a larger report titled “Großbaustelle Nachhaltigkeit – Deutschland und die globale Nachhaltigkeitsagenda”, which will be released 5 September 2017 by CorA – Netzwerk für Unternehmensverantwortung, Deutscher Bundesjugendring, Deutscher Gewerkschaftsbund, Deutscher Naturschutzring, Diakonie Deutschland, Forum Menschenrechte, Forum Umwelt und Entwicklung, Forum Ziviler Friedensdienst, Global Policy Forum, Netzwerk Steuergerechtigkeit, Plattform Zivile Konfliktbearbeitung and VENRO – Verband Entwicklungspolitik und Humanitäre Hilfe deutscher Nichtregierungsorganisationen with financial support from Engagement Global on behalf of the German Federal Ministry for Economic Cooperation and Development, as well as the Federal Ministry for the Environment, Nature Conservation, Building and Nuclear Safety and the Umweltbundesamt (Federal Environment Agency). For further information, please see www.2030report.de.